In the first article of my bubbles series, I talked about how bubbles work. Bubbles are a major aspect of nullsec life, and one of the things that often worry empire dwellers when heading into the great beyond. However, understanding the mechanics is only only half the battle; in this article, I'm going to explain how best to actually avoid them. We're going to start off with the relatively simple task of avoiding drag and catch bubbles. After that, we'll look at how to escape from bubble-equipped gatecamps. Avoiding drag and catch bubbles is relatively simple when you know that they're there. Since these bubbles will only catch you if the direction you're warping from is aligned to the bubble, all you need to do in order to evade them is warp in from another direction. The most effective solution is to use unaligned bookmarks, set up on grid with all the gates you regularly use. I strongly recommend creating some of these if you frequent an area, since their usefulness can't really be overstated. You'll want them greater than 150km from the gate (I aim for over 250km to be clear of sniper fire from the gate), and well out of alignment with any celestial. These allow you to warp to your bookmark, observe the gate visually, and then warp down if the gate is clear of bubbles. Assuming you're operating in area where you don't have bookmarks, you're going to have to be a little more creative. The first thing that you should do is try to scan your exit gate with the directional scanner - this will require getting within 14.3 au of it if you aren't already. System gates will usually be close to a planet, so you can simply warp to that planet, its customs office, or a belt in order to get into easy scan range of the gate. Regional and constellation gates will often be outside scan range of all celestials, and you may need to use cap dumping to get close to them. Anchored bubbles will display on scan as 'mobile small/medium/large warp disruptor', while interdictor bubbles will show up as 'warp disrupt probe'. HIC bubbles will not appear on scan, however the ship itself will. Learn the names of the four HICs (broadsword, onyx, phobos, devoter) and the four dictors (sabre, flycatcher, eris, heretic) - these ships should all turn on the warning alarms if you see one of them on your scanner. It's common for people to anchor bubbles off grid from stargates for storage (known as bubble farms), and often you'll see a bubble on scan towards a gate without it actually being on the gate - running a narrower scan may confirm, depending on just how far off gate the bubbles are anchored. When it comes to HICs and interdictors however the likelihood is that these will be sitting at 0 on the gate, meaning no matter which direction you warp from their bubble will catch you if it is deployed (and if it isn't, they may well go through with you and bubble on the other side). The best location to warp from is one which is not on the list above, and if possible is as far from all of these as possible. In the example below, my exit gate it outside of scan range. The obvious location to warp from is the station which is well out of alignment from the other stargate, however a smart camper may have placed a bubble in line with this too. 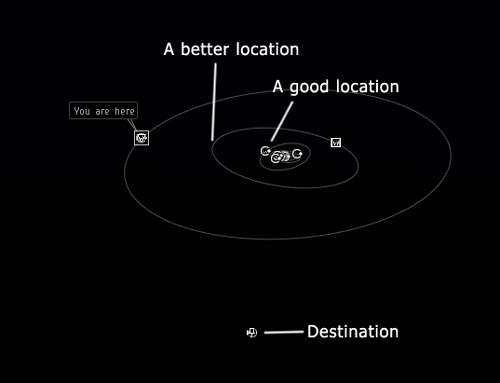 A good location would be one of the central planets (ideally one quite far from the sun itself), since the chances of a bubble catching from these is fairly low. The safest option of all however would be to warp from a mid-safe which is out of alignment with all celestials. Should you land in a bubble with a camp, you're likely to have a tough fight on your hands - most bubble campers will be watching targets entering the system, and will move off from their bubble if they see something they can't take relatively easily. However if you're close range fit on a ship that people generally don't expect to be a threat (for example a bait exequror or dual web ferox), warping directly into camped bubbles can be an excellent way of producing fights at your ideal range! If escape is order of the day, your best chance of getting out is to head right back the way you came, and attempt to warp off as soon as you're outside the bubble - this is usually the shortest route out, and also guarantees at least one warpable object will be on your alignment. Some of the more agile frigates may find they never actually enter the bubble's area and are able to warp out fairly quickly, while plated battleships will probably find themselves almost at the centre. If the bubble is uncamped you might choose to simply fly down to the gate manually - I wouldn't recommend this if you're flying anything particularly vulnerable (since it leaves you open to getting tackled off gate fairly easily), but in anything fast you shouldn't have a problem. The good news is that if you're travelling straight towards the gate, you should also be on alignment to the gate you started at originally, meaning you can potentially warp out quickly if for example a hostile gang comes through. Let's imagine you go through a gate, and you're inside a bubble. 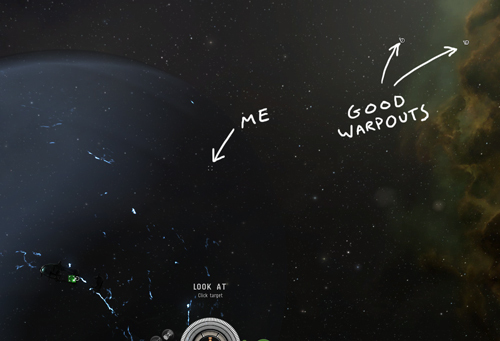 For most, this is the kind of situation that you eventually run into on your first trip into nullsec (sometimes sooner rather than later), and it's often followed shortly by your demise. However, that doesn't need to be the case! When you come into a bubble camp, you have two options - you can attempt to make it back to the gate, or you can try to burn out of the bubble. Remember that you have a full minute of invulnerability while you wait out your gate cloak, so use that time to assess the hostile gang composition and decide on the best route. Sometimes waiting will even mean the hostile gang moves on, but if they noticed you come into system (which they probably did) then that's very unlikely. In fact if anything, it's more likely that waiting too long will simply give them more time to spread out and prepare. With the new jump button, crashing back to the gate is relatively simple - simply select the gate and hit jump, then fire up your afterburner or MWD as quickly as possible, ideally on overheat (shift click and then regular click to turn the heat on quickly, if you try to fiddle around with the overheat button you often lose more time than you would have gained). Your gate cloak will drop slowly giving you a short headstart, after which the hostile ships will need to lock you (made easier if you're running an MWD, but the extra speed makes up for it). In a fast frigate, it's often possible to hit the gate before hostile ships are even able to establish lock. In a larger or slower ship you're likely to get locked, shot and tackled before you reach the gate itself, the real question is how far you'll get before that happens, and how quickly you can move afterwards. As soon as you hit 2500m from the gate, your ship will automatically jump through (providing you haven't aggressed anyone), and with most of the hostile gang aggressed on the other side, you may have escaped. Smart gangs will send at least one tackler through right at the start to deal with exactly this kind of situation, so in a larger ship you'll need to deal with whatever awaits you on that side before you're able to warp off, and you'll need to do so before the 1 minute aggression timer for the guys on the far side wears off. Incidentally, this can be a good way to split hostile gangs if you're confident that you can kill some of them but not all - get as many as you can aggressed on the initial side of the gate, and then take out whatever doesn't aggress once they follow you through. Burning out of the bubble tends to be harder, and requires a reasonably fast ship. Since you're going to be burning away from the gate, your chance of survival relies on your ability to either evade or kill hostile tacklers while you make your escape. The first thing to do is find the closest edge of the bubble to your position, and then locate a celestial (or ideally a cluster of celestials to make it difficult to follow you) which are roughly in that direction - this will be your align point. If hostile tacklers are orbiting the gate at range wait until they are heading away from you, and then hit align and overheat that MWD (I'm assuming here you don't have an afterburner - see my previous comment about needing a fast ship). As soon as you're out of the bubble, you should be free to warp off to your chosen celestial (at range of course, don't warp to 0 and immediately get caught again by the tackler which will probably follow you). If you do get tackled before you can warp, don't worry - you'll probably have covered some distance (and if you're tackled by a long point interceptor, you'll continue to do so), so you still have a chance to kill or force off tackle before the hostile gang is able to get on top of you. This kind of tactic can be quite popular for kiting ships since it will almost definitely result in a chase, however it's risky because the chances of you starting in or close to scram range of a tackler are fairly high. In general, crashing the gate has a much higher rate of success. It does however have the disadvantage that you end up on the same side that you started, rather than the side you were trying to get to. It also leaves the possibility of a repeat on the other side, while burning out of the bubble is a one time thing - once you warp off, you're clear (assuming they don't chase you in warp). Burning out of the bubble is generally viable if you're in a fast ship, and if the opposing gang has relatively few fast tacklers (in particular, fast tacklers with scram/web). If the opposing gang has a rapier/huginn or lachesis/arazu, burning out is probably not going to work. 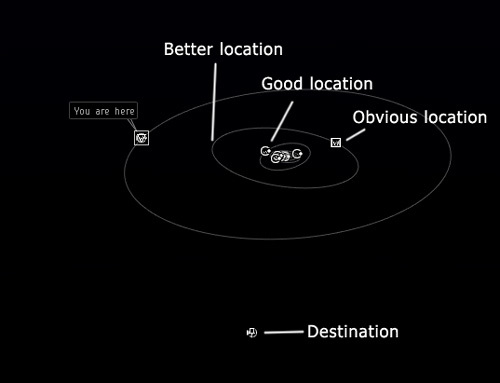 Your choice may also depend on your position within the bubble - distance to the gate will always be around 12km, but depending on the bubble placement you may have 2km to the edge or you may have 10km (you might even be outside it to begin with, particularly on large regional gates). Make your decision and remember, if in doubt, overheat! One word of warning - just because there's no bubble up when you come through doesn't mean you won't be bubbled. Some dictor pilots will wait with their bubble until they see you decloak - if you've just hit warp, this will cancel your warp and bring you swiftly to a standstill, making you an easy target for hostile tacklers. If you come into a camp and see no bubble, check the field for interdictors and make sure you're at least 20km from them (24km for HICs). If you're not, treat it like any other bubble camp and align for a celestial that takes you directly away from the gate, then warp once you're up to speed if no bubble goes up (or once you're out of it, if one does). Of course it's possible for a dictor to be cloaked until they need to drop a bubble, and if you suspect that then the most effective solution is to hit align, followed by warp. If there's a cloaked dictor present they'll usually decloak just after you do, so simply don't hit warp and hit your MWD instead to burn out. Cloaky ships have it significantly easier - so long as you're cloaked, you cannot be targeted and so cannot be tackled. However if you come within 2km of another (non-cloaked) ship, drone, cargo container, or other piece of debris then your cloak will drop and you'll be a sitting duck. Your aim therefore is to get out of the bubble (or back to the gate, if that's your wish) without being decloaked by anything. Unfortunately, it's not all up to you - during the brief moment between you breaking your natural gate cloak and engaging your cloaking device, your position will become apparent to any ships sitting on grid. At that point, any fast ships camping the gate are going to start burning towards wherever it was they thought they saw you, in the hopes of coming within 2km of your position and decloaking you before you're able to get out of the bubble. This is easier said than done however, and there are some things that you as the cloaky can do to make it even more difficult. The following advice is aimed at ships with a covert ops cloaking device - the same applies to those with regular cloaks, however you will be travelling much more slowly and your chances of escape are usually slimmer. Firstly, you again want to make sure we get out of the bubble as quickly as possible - the sooner you're out, the sooner you're safe to warp off. Secondly, you want to move fast - if you're moving quickly, it'll be much less likely that anyone heading towards your previous position will decloak you. Thirdly, you want to move unpredictably - this helps you evade those smarter pilots who attempt to guess your cloaked trajectory. Getting out of the bubble quickly is an obvious one - as with the example above, you need to pick a direction that takes you towards the closest edge of the bubble, ideally with some celestials to warp to once you're clear. Moving fast is easy enough too, providing you have a MWD fitted - just double click or hit align to begin moving, and quickly hit your MWD and cloak (you can actually hit the cloak first, and the MWD cycle will still be picked up if you do it quickly enough). Despite not being able to keep your MWD running while cloaked, you will still benefit from the full first cycle, giving you a whole 10 seconds of high speed with which to put some distance between you and your hunters. When it comes to predictability, a clever gatecamper may guess which direction you're going to try to move (this is especially true if all or most celestials are in a single direction), or may spot the direction you're aligning in the brief moment before your cloak becomes active. Having done this, they may then attempt to intercept you by offsetting their own course in that direction. To avoid this, you can try aligning in one direction as you cloak and hit MWD, and then altering your course to travel in a different direction instead - since you'll be cloaked by this point, the hostile tacklers will not see your change of course and will not be able to intercept you. Be warned however, making a significant change of course will lose you some valuable speed, and those pilots who head blindly for your original location may be more likely to decloak you as a result. After your MWD cycle wears off, it's likely that you will have travelled far enough to drastically reduce the chances of you being decloaked - at this point you can either proceed with your escape, or watch the gate from your cloaked position to provide intel to friendlies. Remember that if you warp off and warp back, you will be caught by the bubble and may risk decloaking depending on where hostile tacklers are positioned at the time. Remember, if you come into the camp and hostile ships are currently at range from the gate, you're in much more danger than if they're sitting at 0. When a cloaky is reported jumping in, many FCs will tell their tacklers to orbit the gate at 10km (which puts them at about 12km actual distance), with the intention of getting them close to your potential position ready for when you decloak. Strangely enough the fact that these tacklers will usually be orbiting rather than keeping at range is a pretty large point in your favour - wait until you're in a gap and most tacklers are heading away from you (which will increase the time it takes for them to begin heading in your direction) and then make your move. Alternatively if you enter a camp and tacklers are not currently set up in this way, beginning your escape as quickly as possible will give them minimal time to prepare and increase your chances of a clear getaway. The one thing you should never do in a cloaky is go through a gate at the same time as a hostile gang of more than a handful of ships - the game will automatically spread ships out around the gate, but when following a larger gang there's a good chance that one of those ships will spawn close to or even within 2km of your position, which will prevent you from cloaking in the first place. Incidentally, if your gang is ever being followed by a cloaky t3, having them all jump through a gate, decloak and then immediately ctrl+space gives you a pretty good chance of catching it on the other side! This is all excellent information, and I've used it to great benefit in my short time in 0.0 so far. To be honest, I recently ran 51 jumps in a frigate down to new sov space, only encountered one bubblecamp the entire way (all through null.) Either way, still a great article and good information, keep it up. Great information and excellent writing. Thanks for taking the time. 1. Jump into new system. I'm in a bubble, there are ships orbiting the gate. 2. Attempt to exit the bubble in the shortest direction. Activate AB and re-cloak. 3. I didn't change my direction. 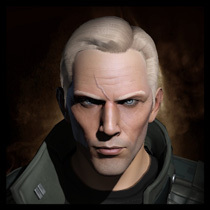 An interceptor with orbiting drones caught up and de-cloaked me at the edge of the bubble. 5. Second bubble goes up around me. I'd add that using the tactical overlay can make it easier to burn out of bubbles, as it's more obvious where the closest edge of the bubble is.